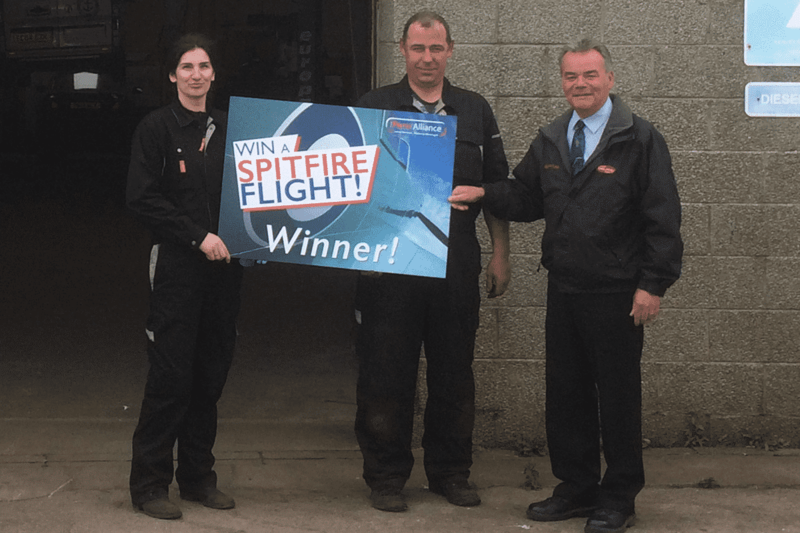 Three lucky customers recently won a flight in a Spitfire, thanks to The Parts Alliance. customer of our Allparts Wycombe branch was also a lucky winner of a Spitfire flight. The business was set up by John Riley and Mike Bryant in 1983 and has been a loyal customer of Allparts since that day. Mike’s daughter Cindy runs the garage for them as they are both semi-retired. When the business started off they worked out of one unit and soon expanded into taking on a second unit and then another 10 years ago, all on the same site. They’re a well-respected and trusted business offering all makes MoT, service and repair. A member of the Bosch car service network since 2004, they work to very high standards and invest heavily in training for their staff with them attaining ATA accreditation. To say that I was overjoyed would be an understatement! It truly is a dream come true as I have a genuine passion in historical aviation. What do you think it will be like flying over the white cliffs of Dover in a Spitfire? It will be incredible and a really fantastic experience and one that I’m very much looking forward to. I have registered with Red Letter Days and I am looking to do it in September as I would like to link it into The Battle of Britain to make this even more special. I feel that this will really be appropriate and am looking to tie this in accordingly. Why do you choose The Parts Alliance for your steering & suspension? We’ve been using them for years and always liked the product and support. We have a good relationship with the Delphi rep, Neal Pegler who comes in with Ben from Allparts from time to time and is always very helpful. My husband and I opened our garage in 2009. We are a strong team of eight who pride ourselves on providing high quality work for our loyal customer base. We have eight ramps and offer servicing, repairs, diagnostics and stock and fit tyres with a 3D four wheel alignment system. I would class ourselves as a forward thinking and innovative company and continuously look at ways for improving our services to our customers. We were really shocked and happy! We never win anything! But something like this, wow, what an amazing opportunity! To fly over the white cliffs of Dover in a Spitfire – the iconic aircraft that played such a major role in World War 2. It’s going to be spectacular and an experience I will never forget! We haven’t arranged when to go yet but will be going as soon as work allows. Customers always come first! We have used them for years because of the great quality parts and trusted brands. We’re a family run business, started at Rosehearty nearly 10 years ago, before we moved to Fraserburgh where we’ve been for 12 months. We offer all types of car repair, including diagnostics, MoTs and tyres. Our customer base is quite large and growing all the time. Absolutely delighted and shocked to have won! My wife Ingrid will be taking the flight. of Dover in a Spitfire? Flying over the White Cliffs of Dover in a Spitfire – it speaks for itself! Looking possibly at the end of August. Why do you choose Dingbro for your steering & suspension? Reliability, quality, price and availability. Being a busy garage we want to fit and forget, getting on to the next job.